Have you used almond flour before? It can be dense because it’s higher in protein and healthy fat. But, there are some strategies to using it for the best muffins ever! I share those secrets in this recipe video…. 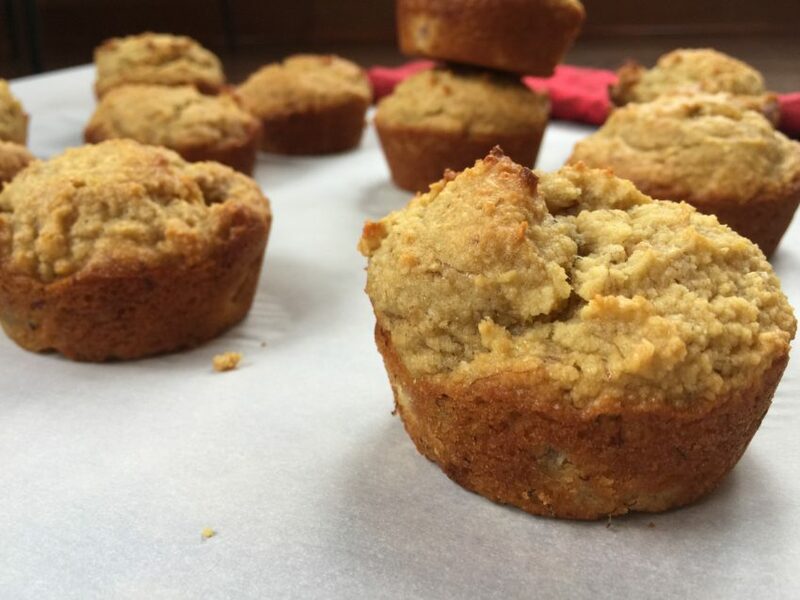 These easy banana muffins are made in one bowl, are gluten-free, and high in protein! Almost 11 grams of protein for one muffin -which is INCREDIBLE. …and only 3/4 teaspoon of added sweetener (which comes from raw honey) per muffin, which, in my book, is another incredible feat. Remember, baked items made with almond flour are going to be a little more dense than normal, but they are seriously delicious! I do LIVE healthy cooking videos weekly here, and I would love it if you would join me! 1. Preheat oven to 350 degrees F. Spray a muffin tin with nonstick spray. 2. In a medium bowl, add in the 2 ripe bananas and mash against the side of the bowl with a fork until they are a puree. Add eggs and whisk together with mashed bananas. Stir in peanut butter and honey until you have a smooth consistency. 3. Add in almond flour, baking soda and powder on top of the wet ingredients, folding them in until batter is smooth. Gently fold in banana chunks and lemon juice. 3. Divide the batter equally among the muffin tins. Bake for 20 minutes, until done. Muffins should be fluffy and have an excellent texture! – for freezing, let muffins cool completely, then place them in a zip-top bag, seal tightly and label. To reheat, either thaw them the night before breakfast, or quickly heat in the microwave or oven. Enjoy muffins within 3 months. Weight Loss Cooking Class Recipes!